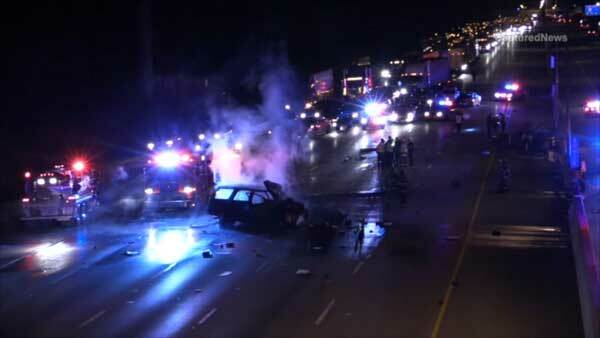 A deadly crash is causing major delays on eastbound I-80/94 near Chase Street in Gary, Indiana. GARY, Ind. (WLS) -- A 25-year-old Hebron, Ind., man was killed Friday morning in a northwest Indiana crash on eastbound I-80/94, officials said. The victim, Nicholas Alderfer, sustained severe burns and blunt force trauma, according to the Lake County Coroner's Office. He was pronounced dead at the scene at 3 a.m.
Indiana State Police said a Ford SUV, which was driven by Alderfer, was weaving in and out of the two left lanes of eastbound I-80/94 about a mile and a half east of Burr Street in Gary around 1:10 a.m. The SUV went off the road and hit a vehicle on the inner shoulder, flew into the air, rolled several times, caught fire and landed upright in the middle lane. State police said several drivers stopped to try to get the driver out, but they were unsuccessful. Investigators closed all but the right lane of eastbound I-80/94 near the crash site for nearly six hours. Traffic was backed up for miles. All lanes re-opened by around 7 a.m.